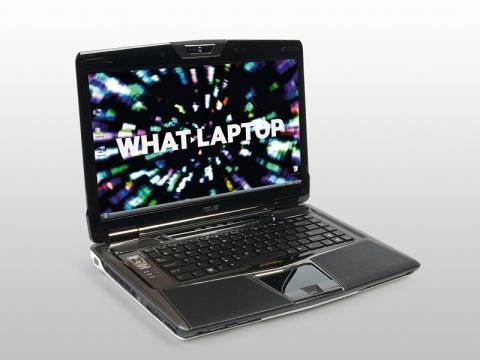 The Lamborghini VX range represents the top of Asus' laptop line and the VX5 (£1999 inc. VAT) is the latest model. With a 16-inch screen, it's large enough to use as a multimedia centre and desktop replacement, yet still offers portability. Our review sample featured a stunning 1920 x 1080-pixel resolution, but problems with supplies have led to production machines featuring a less impressive 1366 x 768-pixel panel. While acceptable on budget laptops, it seems like an oversight on a laptop of this specification. The screen also features ambient backlighting – dimming, where conditions allow – and is mirrored by the backlit keyboard. An integrated Blu-ray drive lets you watch high-definition (HD) films. With graphics handled by a dedicated Nvidia GPU, there's enough 3D power to handle multimedia tasks with ease, and HD movies play back smoothly. The latest games also run on this machine, but you may have to turn down the resolution settings in more demanding titles. Asus claims the style of this laptop is influenced by the Lamborghini Reventon sports car, with an edgy contemporary design. The quality is largely very good, but there are slightly too many materials, textures and design details for our liking. Materials such as brushed aluminium and leather help to create a premium feel, although some of the glossy plastics could be a touch more robust. The thick display is held firmly in place as you type, however. The keyboard features an isolated-key design. The spacious keys look great and offer a responsive and positive typing action. It's also a quiet board to use, although some users will naturally prefer a longer keystroke, so try before you buy if possible. The highly stylised touchpad features a mirrored appearance and is large and functional. As befits a machine of this price, high-end components are featured throughout. A quad-core Intel Core 2 Quad processor and 4096MB of fast DDR3 memory deliver fantastic multi-tasking capabilities, and this laptop ran quickly and smoothly during all of our benchmark tests and in daily use. It also leads the market when it comes to storage space, with two 500GB hard drives in place. There are four USB ports for adding peripherals, one of which doubles as a high-speed eSATA port for connecting external hard drives. HDMI and VGA-out interfaces let you connect digital and analogue monitors, respectively. With its high price, the Lamborghini VX5 is for those seeking a designer laptop, but that doesn't mean it's a bad product. With terrific performance and a standout design, it makes a highly impressive desktop replacement.